A few months ago, I finally abandoned Eudora as my e-mail client (I had been using it since I graduated from Pine in college). I was prepared to hold out for the open-source, Thunderbird-based version of Eudora promised by The Mozilla Foundation, but it seemed to be going nowhere fast. And the latest version of Mail felt polished enough for me to go through the pain of switching clients. So I downloaded a copy of Andreas Amann’s free Eudora Mailbox Cleaner and, with a bit of hard work, got my old mail imported into Mail. As part of my modernization, I also used the switch as an opportunity to move from POP to IMAP. I check and write e-mail on my Mac Pro at work, my Power Mac G5 at home, and on my iPhone and/or MacBook when I’m not in either place. Now my inbox and sent mail for my work account are in sync on all my devices. Then I thought, wouldn’t it be great to use IMAP with my personal e-mail account as well. Of course it would, but it turns out that’s easier said than done with Mail. DSLExtreme has been my ISP for many years now, and the way it handles e-mail is that it places the Drafts, Sent, Trash, and Spam folders as subfolders of the Inbox. 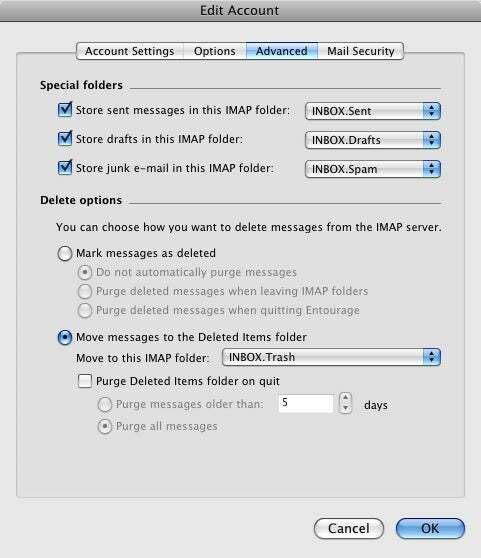 Entourage figured out the IMAP settings for my account, while Mail floundered. And as I tried to set up Mail to access that account via IMAP, that subfolder behavior turned out to be a problem. Mail added a disclosure triangle to my personal inbox, and clicking on it showed the various folders in it—but Mail couldn’t see any messages in those folders, and it couldn’t save sent or draft messages to the server as expected. On a DSLExtreme support forum, someone pointed me to an Apple discussion thread talking about how Mail has an issue with subfolders on an IMAP account. Someone suggested trying Entourage and, much to my surprise, it could handle the IMAP subfolders with ease. Mail is light-years ahead of Eudora in most ways—in-line HTML rendering, anyone?—but IMAP has been around for more than 20 years, and the current version of it for more than 10 (not to mention Mail is approaching its seventh birthday). To me, this is black eye for an otherwise great piece of software. I’m not about to jump ship again for Entourage, but by this point in Mail’s life, I’d at least hope that the kinks would be worked out.